Harvard Business School Press, 9781422130025, 298pp. You might think the key to innovation is attracting exceptional creative talent. Or making the right investments. Or breaking down organizational silos. All of these things may help--but there's only one way to ensure sustained innovation: you need to lead it--and with a special kind of leadership. Collective Genius shows you how. Preeminent leadership scholar Linda Hill, along with former Pixar tech wizard Greg Brandeau, MIT researcher Emily Truelove, and Being the Boss coauthor Kent Lineback, found among leaders a widely shared, and mistaken, assumption: that a "good" leader in all other respects would also be an effective leader of innovation. 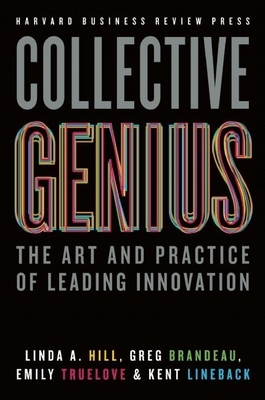 The truth is, leading innovation takes a distinctive kind of leadership, one that unleashes and harnesses the "collective genius" of the people in the organization. Using vivid stories of individual leaders at companies like Volkswagen, Google, eBay, and Pfizer, as well as nonprofits and international government agencies, the authors show how successful leaders of innovation don't create a vision and try to make innovation happen themselves. Rather, they create and sustain a culture where innovation is allowed to happen again and again--an environment where people are both willing and able to do the hard work that innovative problem solving requires.